Building GUI is a crucial part of any application with requires user interactions. Mostly when interactions involves Graphical Representations. It could be in form of Data Display or for taking inputs from users. Java provide JFrame class from javax.swing extented from awt library to support swing components capabilities. 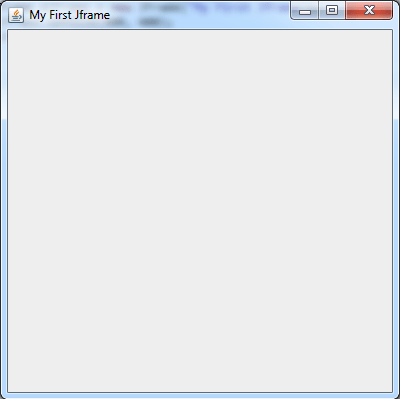 We are going to present some basics of JFrame and will tell how to create simple GUI applications in Java. This article will more focus on code rather then talking extra details. So let’s get started. To display a simple GUI which obviously will be only a simple frame we just have to include Jframe package and later on create an Instance of Object and set visibility to true. Remember to do all this thing in your main() function so that it could actually be able to run. First lets create an Empty class under our required package(You may name any package). Now that we have our working class lets add an Instance of JFrame into it. By default the JFrame will appear on Top Left corner of your screen. If you want to change this behavior, you may do this using available method called setLocation(int x, int y) This method will take two arguments first is the X point of the Screen and second is Y point. There is also another overloaded method which takes Point() instance so you can also pass an Instance of a Point class. Now to (for example) display our GUI in specific x,y location on the screen we may use following line to make it happen. providing null in argument will make frame Center to Screen. But this method expect a component object and set Location relative to that component. Now by setting this to false, you will not be able to resize the window either by dragging the frame or by pressing the maximize button. As you may have noticed that the maximize button had been disabled. Although we had provided the title of JFrame via it’s constructor but if we wish to add or change the title of the JFrame later on in our code we can do this with help of title property. This property is available under default getter and setter functions of JFrame class. Which means we can also read the current title of the window with the help of getTitle() method. This method will return String object containing the current title of the JFrame. Similarly if you wish to add title you can use setTitle(String name); method to change the title of JFrame. This method accepts String object as an argument and the title of JFrame will be replaced with this string object. Before leaving Let’s make our boring GUI some dynamic and interactive via adding a simple Button to it. To add button into JFrame we first had to create an Instance of JButton Class. But this line will make button to be appeared whole over the JFrame. To be this button under its limits and bounds we need to handle layouts. Proper layout managers handle the way component will be placed over JFrame. We will explain Layouts in our next tutorial, but for now to make things simple just add following line before setting the visibility true and after adding button to mJFrame object.